As soon as your purchase is completed we send you any keys you need for access to your wood. Then we give you a package of books and subscriptions that we hope will make it easier and more enjoyable to get started. These include copies of our two books "Getting Started in Your Own Wood" (an updated edition of “Badgers, Beeches and Blisters”) and “Managing your Woodland for Wildlife”. 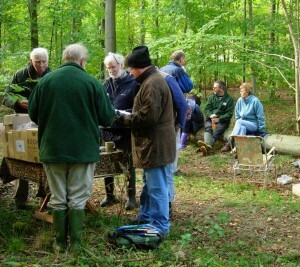 We will introduce you to Small Woodlands Owners Group (SWOG) , an informal group of small woodland owners throughout the country. We will also pay for a year’s membership of the Royal Forestry Society. Both of these organisations send regular magazines or newsletters (SWOG’s is free on-line), and we will also give you access to Living Woods magazine. Last but not least, we promise you up to £300 towards the cost (course fees, not including travel and subsistence) of any course which is going to help you with managing and enjoying your woodland. We have lots of information and ideas on the sort of course you might like to take. And, of course, our local manager will be available to help with introductions to neighbouring woodland owners and residents. He or she can recommend contractors and suppliers and introduce you to the local Forestry Commission Adviser.